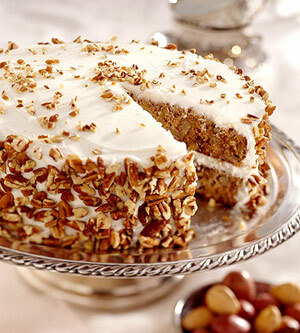 I've got a Hummingbird Cake recipe that will have your friends and family buzzing. Moist and so delicious, this cake is easy to make. I have many easy homemade cake recipes above including many homemade dessert recipes. Sift together flour, sugar, salt, soda and cinnamon. Add eggs, and oil and stir. Stir in vanilla, pineapple, bananas and pecans. Spoon batter into prepared cake pans. Combine all ingredients and beat until fluffy, frost cake and garnish as desired.